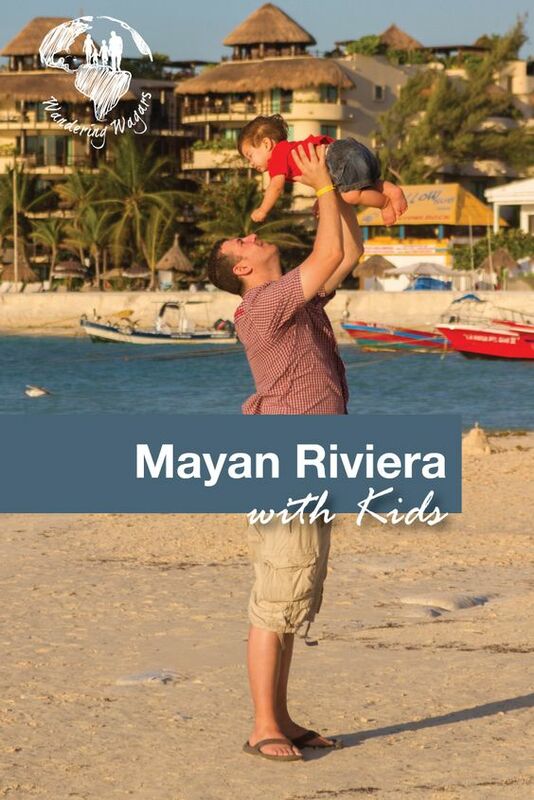 The Riviera Maya in Mexico makes for an affordable and fun family vacation. The area on the east coast of the Yucatan Peninsula is a well-established tourist destination with a range of hotels for all budgets. As a family destination, a large number of hotels cater to families from having kid-friendly meals to playgrounds and kids’ pools in the hotels. We also found that if we reserved one ahead of time, availing of a crib was not an issue. On our vacation, we also ran out of diapers and wipes for C. Luckily, we had booked a hotel that catered to families with young children so both items were readily available at the hotel shop. 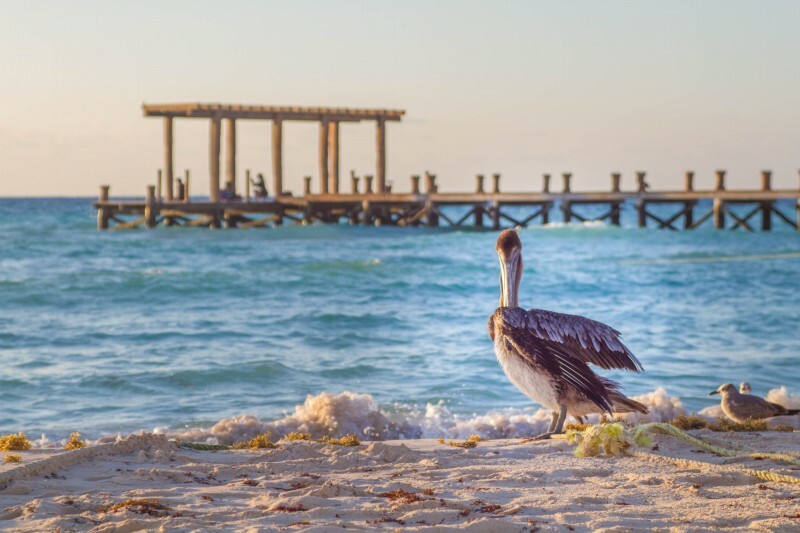 We decided to base ourselves in Playa del Carmen, the second biggest resort on the coast next to Cancun, due to the number of easily accessible day tours that would be available to us. Playa del Carmen boasts the turquoise waters and powdery fine white sand beaches that make Mexico so famous. C was initially unsure about the sand but after a few minutes of coaxing, he was splashing away in his own mini Caribbean Sea. He loved watching all the birds, especially the pelicans, flying around the fishing boats. Although he had no interest in going in the sea, he did enjoy spending hours splashing around in the pool. To get away from the crowds in Playa del Carmen, we joined a day tour to explore the uncrowded beach of Akumal. The tour included transportation to the beach, a snorkeling guide and lunch. 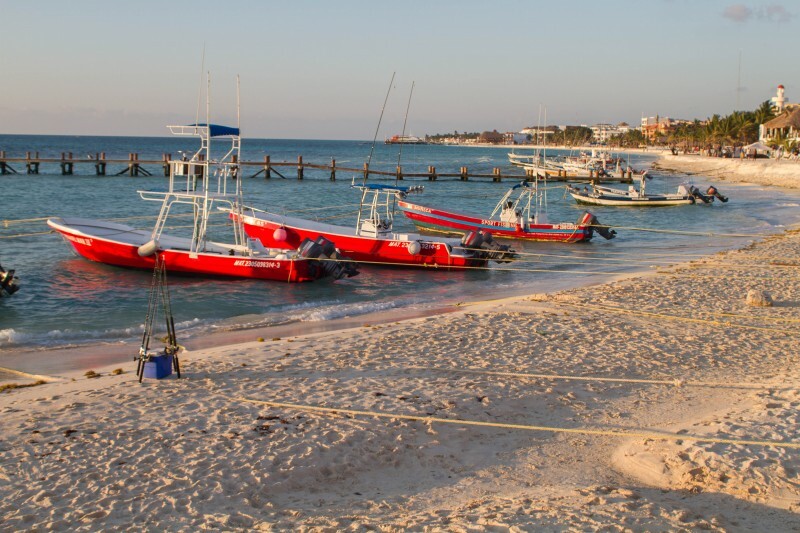 Located just south of Playa del Carmen, the beautiful sandbar is a breeding ground for green sea turtles and in December and January whale sharks have been spotted. Kevin and I took turns snorkeling while C napped on the beach in the shade of a lifeguard tower. The underwater life of Akumal did not disappoint. 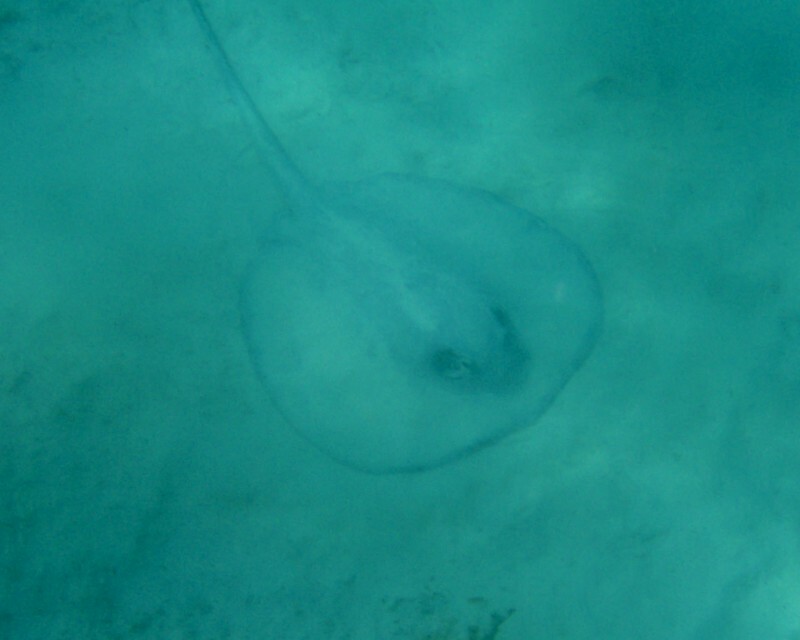 We spotted many colourful fish, rays, starfish, and a green turtle even followed Kevin around. C did not have the opportunity to go in the water as he opted to spend the whole time napping. The life of a six-month-old is tough! Once we had our fill of the beach scene we booked a day tour to see the ruins of Tulum. 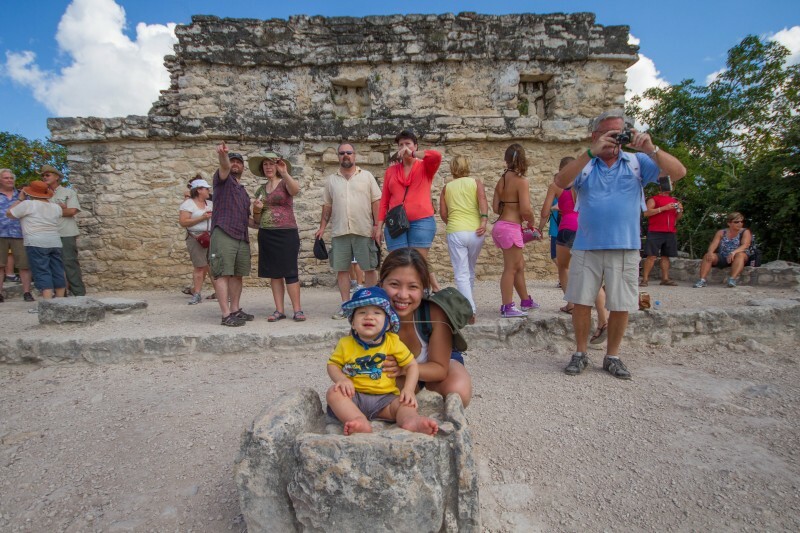 Much like Chitchén Itzá, the ruins were very crowded which was not surprising as it is within easy reach from the hotels along the Riviera Maya as well as being a popular day trip for cruise ship passengers. The Tulum ruins date from around AD 1200. 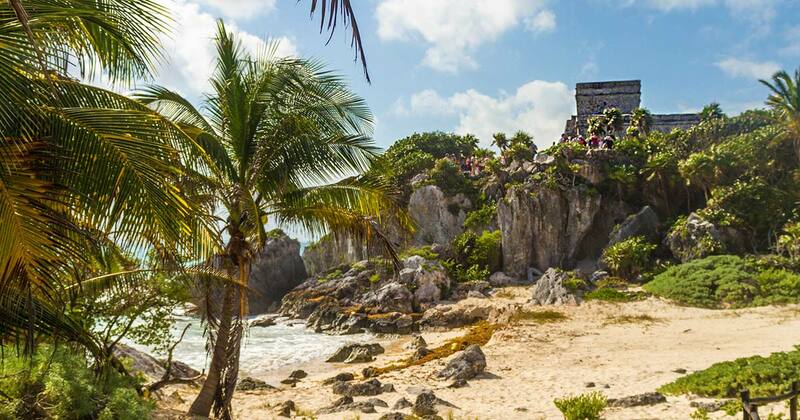 Tulum means enclosure or wall and Tulum is the only Mayan ruin that is surrounded by a perimeter wall. Some people argue that this was the name given to the site by the Spaniards and that the Mayans probably called the site Zama, meaning dawn, due to its location on the east coast. Tulum has many excellently restored buildings. One of the structures closest to the entrance is called the Temple of the Frescoes whose corners have ornate carvings while the walls inside are richly painted. The Temple of Frescoes was likely used as an observatory to track the movements of the sun. Next to the Temple are the House of Columns and the Grand Palace, which features an intricately thatched roof. The most prominent building in the site is known as El Castillo. El Castillo has a staircase that leads up the Temple, however, visitors are not allowed to climb up so we admired it from the ground. Beside El Castillo is the Temple of the Descending God which has a carving on top of the doorway of a falling or upside down man which is thought to symbolize the setting sun. Close to the sea is the Temple of the Wind. Amazingly, this temple was designed to have special acoustics that functioned as a storm warning system. Pretty cool for a building that is nearly a millennia old. Nearby is the House of the Cenote. A cenote is a water-filled sinkhole and the Riviera Maya has several that can be explored by either snorkelling or diving. We dove the Dos Ojos cenote while visiting Cancun, and it was incredible! Tulum offers many sites for children to explore. C loved running around from site to site. 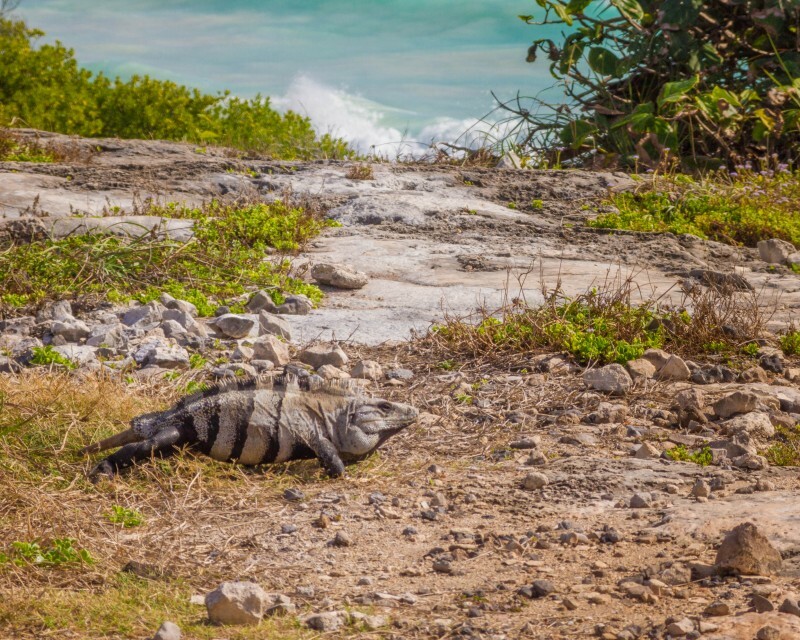 We also spotted many iguanas basking in the sun. C enjoyed trying to spot them and then pointing them out, luckily for the iguanas, he couldn’t walk yet or he probably would have spent all day chasing them. After visiting the ruins we wandered down the steps near the Temple of the wind to the playa down below to spend some time relaxing in the turquoise waters of the Caribbean sea. After spending hours walking amongst the ruins, a jump in the sea is exactly what we needed. Inspired by the beauty of the ancient city of Tulum we headed off to visit another nearby ruin. The Mayan city of Cobá had its heyday from AD 300 to AD 1000. The city was thought, at one time, to have housed as many as 40,000 people. Cobá is sprawled over a very large area, however, much of it still hidden by the surrounding jungle. The encroaching wilderness and feeling of isolation give an ambiance of mystery and an allure of discovery to the site. 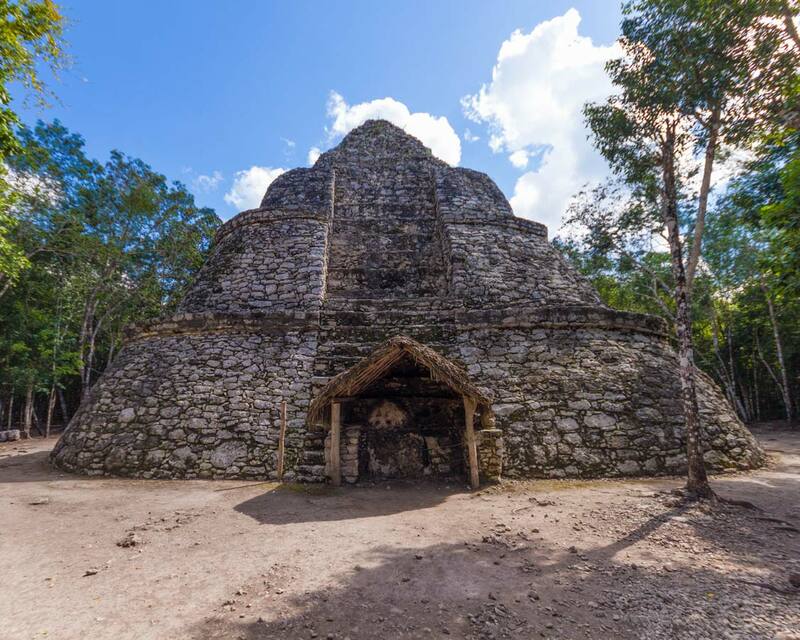 Cobá houses four main building clusters: the Cobá group (Group B), the Mecanxoc group (Group C), the Paintings group (Group D) and the Nohoch Mul group (Group A). The sites are not close to each other and bike rentals or bicycle rickshaws with drivers are available. Since C was with us, we decided to save our energy and avail of the rickshaw for a fun ride between the sites. The cluster closest to the entrance is the Cobá group. The most popular building is known as the Church and is the second tallest structure in the city. The Church rises in nine stepped stages and is topped by a temple. It is thought that most of the structures in the Cobá group were residences. There is also a nicely reconstructed Ball Court which still has its carved stone rings. I really liked how the jungle seemed to be reclaiming the site. It definitely gave the ruins an air of mystery. We hopped onto the rickshaw and took off down the sacbe (raised paved road) towards Maxcanxoc Group (Group C). It was interesting to have a closer look at the eight stellae lying around the complex and to try and decipher what they were trying to tell us. Next, we headed over to the Paintings Group (Group D). 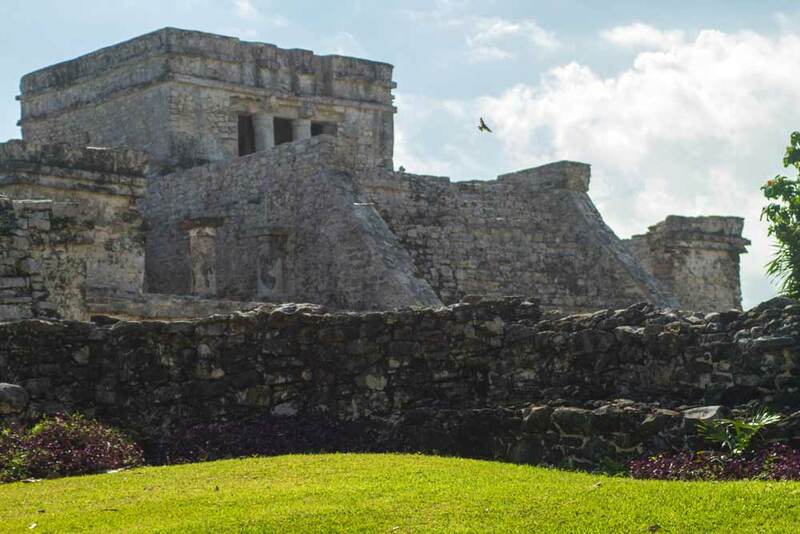 The Temple of Paintings is the most famous and is similar to many of the structures in Tulum. The temple has a pyramid base with a staircase that leads to a temple on top. Saving the best for last, we made our way to the Nohoch Mul Group (Group A). The climb is not for the faint of heart, however, the reward when you get to the top is worth it. The view looking out over the jungle canopy are absolutely breathtaking! Riviera Maya certainly didn’t disappoint. We can’t wait to go back to explore more ruins and beaches. This time with two children in tow! So many lovely places, thank you for introducing me to them! Love the photos. The special acoustics as a storm warning system is so cool! I am a huge fan of the Yucatan. Your story and photos bring bad memories. 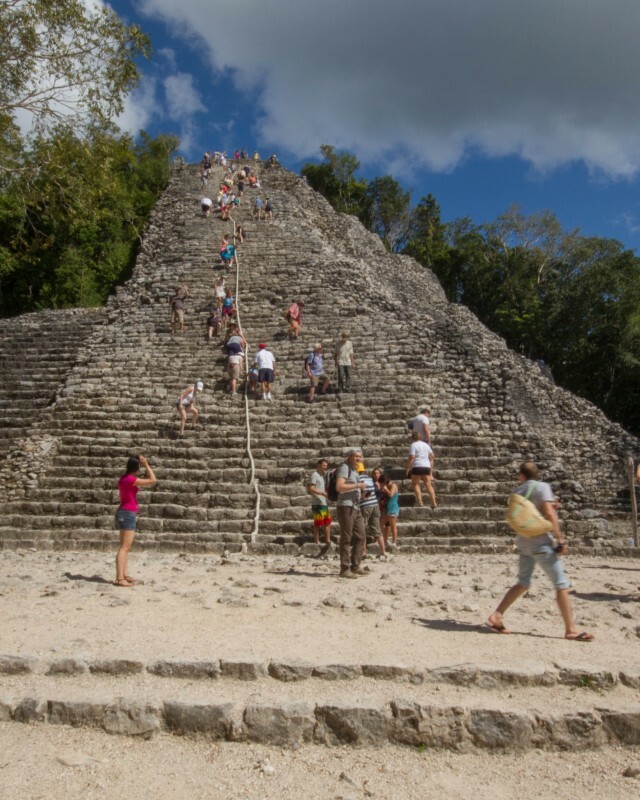 I was at Coba when it fewer crowds, so on later visits, I was amazed to see large crowds like at Chichen Itza. But, it’s nice that people are able to see these wonders. Would you recommend the area for families traveling with older (teenage-ish) children as well? Thanks for the great info! Absolutely. There is a lot of places to explore, great shops and nice beaches. The cenotes are exciting to explore and the ruins are fun for all ages, especially the beach near Tulum. I’m sure you must have had some amazing experiences. Most places in Central America are a treat! Ah! These pictures have me wanderlusting hard! Looks amazing. Thanks for sharing. I’ve been curious about Tulum for a while now, but never heard of Coba before! I like that the ruins are grouped into different sites, and love the view from Group A! This looks like such a great blend of relaxation and exploration. We did a very similar trip to the region with our then 3 year old. That trip made such an impression on him! He learned about composting, speaking Spanish and about ruins!! Years later he is still super jazzed about all three!! The Riviera Maya looks like a fascinating place, I am bowled over by the beach, the turquoise water and the white sands. The ruins are another remarkable source of attraction for me. So much of history in stone. Would be a great trip. As always thanks for sharing your experiences, always a pleasure reading about your travels.